Evening light on Mount (Mt) Stokes (1203m) above Queen Charlotte Sound. Arapaoa (Arapawa) Island. 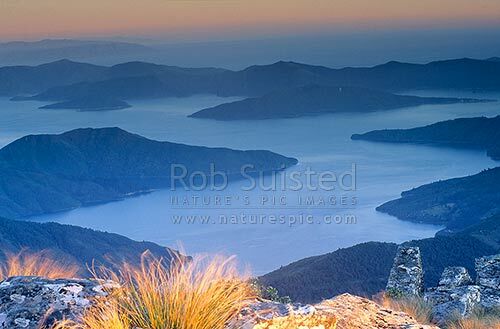 (mid), Wellington coast beyond, Marlborough Sounds, Marlborough District, Marlborough Region, New Zealand (NZ), stock photo.